COEBURN – The Virginia Tourism Corporation announced today that Spearhead Trails will be featured on the cover of the 2018 Travel Guide. The guide, published annually, is produced by the Virginia Tourism Corporation and Roanoke-based Leisure Media 360. 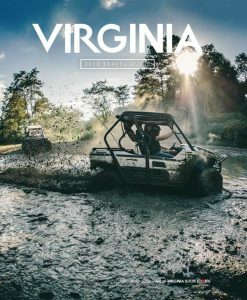 Available for free on Virginia.org and at Virginia State Welcome Centers, the 2018 Virginia Travel Guide is a love letter to Virginia vacations and includes insider tips on the state’s exciting tourism destinations, from beaches to mountains, state parks to theme parks, wineries to breweries, music to Main Streets and so much more. One of four different covers for this year’s Travel Guide, the Spearhead Trails cover is a limited edition gatefold limited to 20,000 copies. The total number of travel guides printed is 275,000. The other covers featured are Virginia’s Eastern Shore, Historic Montpelier and Beartown Mountain in Russell County, Virginia. Spearhead Trails includes 400 miles of ATV/Multiuse Trails through five different trail systems in Southwest Virginia. Known for uniquely different, challenging off-road experiences, Spearhead Trails offers a satisfying mix of trails for novice riders who want a more easy going experience to the experienced riders who are looking for a heart-pounding, seat-shaking assortment of twisting, turning trails. The total economic activity stimulated by Spearhead Trails in the state during the past year was approximately $9 million. Visitors to the trails have increased state and local taxes by $528,000 and is expected to rise $1.5 million by 2019. Projections for the current fiscal year are expected to be $15.2 million statewide; supporting 163 full time jobs- rising by 2019 to $22.2 million with 250 full time jobs. Beaches – Virginia is a beach destination with beaches big and small – from the Virginia Beach oceanfront to the warm, welcoming sands of the Eastern Shore and great beaches in between, families will find the perfect beach in Virginia. Outdoor Recreation – Virginia’s beautiful mountains, rivers, and coastal waters attract families and adventure seekers alike to unplug, unwind, and just be – whether camping at a state or national park, biking along historic pathways, hiking a mountain trail, or canoeing on the Chesapeake Bay. Main Street Americana – Virginia’s small towns are full of authentic Americana such as local diners, soda fountains, quaint B&Bs and a nostalgic vibe that takes away everyday stresses and transport visitors to a simpler time. Music – Virginia’s music scene boasts a variety of different genres such as bluegrass, country, gospel, R&B, rock and roll, jazz, folk, and more. The diverse music venues and music festivals across the state provide music lovers hundreds of performances a year by world-famous and up-and-coming musicians. LGBT Tourism – Virginia’s LOVE story is bigger and better than ever! The 2018 Travel Guide highlights that Virginia is for ALL Lovers, and is a great destination for LGBT travelers. Visitors to Virginia can experience our beautiful mountains and beaches, fantastic dining scene, historic sites, outdoor recreation, and much, much more. Culinary – In Virginia, food is an experience. Farm tours, local food tours, and authentic coastal culinary experiences take visitors behind the scenes to fully understand Virginia’s devotion to local food. Our fresh, local produce, James Beard nominated chefs and restaurants, and award-winning craft beverages are sure to wow. All told, Virginia has staked its place at the table in any national conversation about “America’s best” food and drink. Wines, Brews and Spirits – Virginia is the “Birthplace of American Wine and Spirits” and continues to attract travelers from all over the world to experience our craft beverages. Use the Travel Guide to plan a visit to some of the state’s 300+ wineries, 200+ craft breweries and dozens of distilleries and hard cideries. Iconic History – Virginia is an American history icon – with hundreds of sites across the state that date back to the first permanent English settlement at Jamestown and cover every important period of American history. Please visit Virginia.org or call 1-800-VISITVA to request a free copy of the 2018 Virginia is for Lovers travel guide.